This article is about the independent city in Virginia. For the city's historic district, see Colonial Williamsburg. Location in the Commonwealth of Virginia. Williamsburg is an independent city in the Commonwealth of Virginia, United States. As of the 2010 U.S. Census, the population was 14,068. In 2014, the population was estimated to be 14,691. Located on the Virginia Peninsula, Williamsburg is in the northern part of the Hampton Roads metropolitan area. It is bordered by James City County and York County. Williamsburg was founded in 1632 as Middle Plantation, a fortified settlement on high ground between the James and York rivers. The city served as the capital of the Colony and Commonwealth of Virginia from 1699 to 1780 and was the center of political events in Virginia leading to the American Revolution. 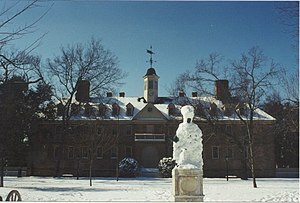 The College of William & Mary, established in 1693, is the second-oldest institution of higher education in the United States and the only one of the nine colonial colleges located in the South; its alumni include three U.S. Presidents as well as many other important figures in the nation's early history. The city's tourism-based economy is driven by Colonial Williamsburg, the restored Historic Area of the city. Along with nearby Jamestown and Yorktown, Williamsburg forms part of the Historic Triangle, which attracts more than four million tourists each year. Modern Williamsburg is also a college town, inhabited in large part by William & Mary students and staff. Prior to the arrival of the English colonists at Jamestown in the Colony of Virginia in 1607, the area which became Williamsburg was within the territory of the Powhatan Confederacy. By the 1630s, English settlements had grown to dominate the lower (eastern) portion of the Virginia Peninsula, and the Powhatan tribes had abandoned their nearby villages. Between 1630 and 1633, after the war that followed the Indian Massacre of 1622, the English colonists constructed a defensive palisade across the peninsula and a settlement named Middle Plantation as a primary guard station along the palisade. Jamestown was the original capital of Virginia Colony, but was burned down during the events of Bacon's Rebellion in 1676. As soon as Governor William Berkeley regained control, temporary headquarters for the government to function were established about 12 miles (19 km) away on the high ground at Middle Plantation, while the Statehouse at Jamestown was rebuilt. The members of the House of Burgesses discovered that the 'temporary' location was both safer and more pleasant environmentally than Jamestown, which was humid and plagued with mosquitoes. A school of higher education had long been an aspiration of the colonists. An early attempt at Henricus failed after the Indian Massacre of 1622. The location at the outskirts of the developed part of the colony had left it more vulnerable to the attack. In the 1690s, the colonists tried again to establish a school. They commissioned Reverend James Blair, who spent several years in England lobbying, and finally obtained a royal charter for the desired new school. It was to be named the College of William & Mary in honor of the monarchs of the time. When Reverend Blair returned to Virginia, the new school was founded in a safe place, Middle Plantation in 1693. Classes began in temporary quarters in 1694, and the College Building, a precursor to the Wren Building, was soon under construction. Four years later, in 1698, the rebuilt Statehouse in Jamestown burned down again, this time accidentally. The government again relocated 'temporarily' to Middle Plantation, and in addition to the better climate now also enjoyed use of the College's facilities. The College students made a presentation to the House of Burgesses, and it was agreed in 1699 that the colonial capital should be permanently moved to Middle Plantation. A village was laid out and Middle Plantation was renamed Williamsburg in honor of King William III of England, befitting the town's newly elevated status. Following its designation as the Capital of the Colony, immediate provision was made for construction of a capitol building and for plotting out the new city according to the survey of Theodorick Bland. 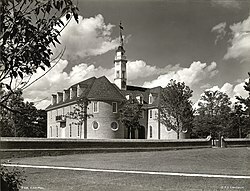 His design utilized the extant sites of the College and the almost-new brick Bruton Parish Church as focal points, and placed the new Capitol building opposite the College, with Duke of Gloucester Street connecting them. Alexander Spotswood, who arrived in Virginia as lieutenant governor in 1710, had several ravines filled and streets leveled, and assisted in erecting additional College buildings, a church, and a magazine for the storage of arms. In 1722, the town of Williamsburg was granted a royal charter as a "city incorporate" (now believed to be the oldest charter in the United States). However, it was actually a borough. Middle Plantation was included in James City Shire when it was established in 1634, as the Colony reached a total population of approximately 5,000. (James City and the other shires in Virginia changed their names a few years later; James City Shire then became known as James City County). However, the middle ground ridge line was essentially the dividing line with Charles River Shire, which was renamed York County after King Charles I fell out of favor with the citizens of England. As Middle Plantation and later Williamsburg developed, the boundaries were adjusted slightly. For most of the colonial period, the border between the two counties ran down the center of Duke of Gloucester Street. During this time, and for almost 100 years after the formation of the Commonwealth of Virginia and the United States, despite practical complications, the town remained divided between the two counties. Williamsburg was the site of the first attempted canal in the United States. In 1771, Lord Dunmore, who would turn out to be Virginia's last Royal Governor, announced plans to connect Archer's Creek, which leads to the James River with Queen's Creek, leading to the York River. It would have formed a water route across the Virginia Peninsula, but was not completed. Remains of this canal are visible at the rear of the grounds behind the Governor's Palace in Colonial Williamsburg. The first purpose-built psychiatric hospital in the United States was founded in the city in the 1770s: 'Public Hospital for Persons of Insane and Disordered Minds'. Known in modern times as Eastern State Hospital, it was established by Act of the Virginia colonial legislature on June 4, 1770. The Act to 'Make Provision for the Support and Maintenance of Ideots, Lunaticks, and other Persons of unsound Minds' authorized the House of Burgesses to appoint a fifteen-man Court Of Directors to oversee the future hospital's operations and admissions. In 1771, contractor Benjamin Powell constructed a two-story building on Francis Street near the College, capable of housing twenty-four patients. The design of the grounds included 'yards for patients to walk and take the Air in' as well as provisions for a fence to keep the patients out of the nearby town. The Gunpowder Incident began in April 1775 as a dispute between Governor Dunmore and Virginia colonists over gunpowder stored in the Williamsburg magazine. Dunmore, fearing rebellion, ordered royal marines to seize gunpowder from the magazine. Virginia militia led by Patrick Henry responded to the 'theft' and marched on Williamsburg. A standoff ensued, with Dunmore threatening to destroy the city if attacked by the militia. The dispute was resolved when payment for the powder was arranged. This was an important precursor in the run-up to the American Revolution. Following the Declaration of Independence from Britain, the American Revolutionary War broke out in 1776. During the War, the capital of Virginia was moved again, in 1780, this time to Richmond at the urging of then-Governor Thomas Jefferson, who feared Williamsburg's location made it vulnerable to a British attack. However, during the Revolutionary War Williamsburg retained its status as a venue for many important conventions. 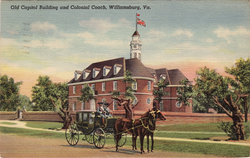 Williamsburg ceased to be the capital of the new Commonwealth of Virginia in 1780 and went into decline, although not to the degree Jamestown had previously experienced. Another factor was travel: 18th and early 19th century transportation in the Colony was largely by canals and navigable rivers. As it had been built on 'high ground' Williamsburg was not sited on a major water route, unlike many early communities in the United States. The railroads which began to be built from the 1830s also did not yet come through the city. Despite the loss to Williamsburg of the business activity involved in government, the College of William and Mary continued and expanded, as did the Public Hospital for Persons of Insane and Disordered Minds. The latter became known as Eastern State Hospital. At the outset of the American Civil War (1861–1865), enlistments in the Confederate Army depleted the student body of the College of William and Mary and on May 10, 1861, the faculty voted to close the College for the duration of the conflict. The College Building was used as a Confederate barracks and later as a hospital, before being burned by Union forces in 1862. The Williamsburg area saw combat in the spring of 1862 during the Peninsula Campaign, an effort to take Richmond from the east from a base at Fort Monroe. Throughout late 1861 and early 1862, the small contingent of Confederate defenders was known as the Army of the Peninsula, and led by General John B. Magruder. He successfully created ruses which fooled the invaders as to the size and strength of his forces, and deterred their attack. Their subsequent slow movement up the peninsula gained valuable time for defenses to be constructed at the Confederate capital at Richmond. In early May 1862, after holding the Union troops off for over a month, the defenders withdrew quietly from the Warwick Line (stretching across the Peninsula between Yorktown and Mulberry Island). As General George McClellan's Union forces crept up the Peninsula to pursue the retreating Confederate forces, a rear guard force led by General James Longstreet and supported by General J. E. B. Stuart's cavalry blocked their westward progression at the Williamsburg Line. This was a series of 14 redoubts east of town, with earthen Fort Magruder (also known as Redoubt # 6) at the crucial junction of the two major roads leading to Williamsburg from the east. The design and construction had been overseen by Benjamin S. Ewell, the President of the College of William and Mary. He owned a farm in James City County, and had been commissioned as an officer in the Confederate Army after the College closed in 1861. At the Battle of Williamsburg on May 5, 1862, the defenders succeeded in delaying the Union forces long enough for the retreating Confederates to reach the outer defenses of Richmond. A siege of Richmond ensued, culminating in the Seven Days Battles. McClellan's campaign failed to capture Richmond. Meanwhile, on May 6, 1862, Williamsburg had fallen to the Union. The Brafferton building of the College was used for a time as quarters for the commanding officer of the Union garrison occupying the town. On September 9 that year, drunken soldiers of the 5th Pennsylvania Cavalry set fire to the College Building, allegedly to prevent Confederate snipers from using it for cover. Much damage was done to Williamsburg during the Union occupation, which lasted until September 1865. However, the main business purpose for the new railroad was unquestionably shipping eastbound West Virginia bituminous coal to Newport News. Using the new coal piers, it was loaded aboard large colliers in the harbor of Hampton Roads for shipment to New England and export destinations worldwide. Due in no small part to the tireless efforts of its president, Benjamin Stoddert Ewell, education continued at the College of William and Mary, although teaching was temporarily suspended for financial reasons from 1882 until 1886. Ewell's efforts to restore the historic school and its programs during and after Reconstruction became legendary in Williamsburg and at the College and were ultimately successful, with funding from both the U.S. Congress and the Commonwealth of Virginia. After 1886, the College became a state school. Benjamin Ewell remained in Williamsburg as President Emeritus of the College until his death in 1894. Beginning in the 1890s, C&O land agent Carl M. Bergh, a Norwegian-American who had earlier farmed in the mid-western states, realized that the gentler climate of eastern Virginia and depressed post-Civil War land prices would be attractive to his fellow Scandinavians who were farming in other northern parts of the country. He began sending out notices, and selling land. Soon there was a substantial concentration of relocated Americans of Norwegian, Swedish, and Danish descent in the area. The location earlier known as Vaiden's Siding on the railroad just west of Williamsburg in James City County, was renamed Norge. These citizens and their descendants found the area conditions favorable as described by Bergh, and many became leading merchants, tradespersons, and farmers in the community. These transplanted Americans brought some new blood and enthusiasm to the old colonial capitol area. Williamsburg was still a sleepy little town in the early 20th century. Some newer structures were interspersed with colonial-era buildings, but the town was much less progressive than other busier communities of similar size in Virginia. Some local lore indicates that the residents were satisfied with it that way, and longtime Virginia Peninsula journalist, author and historian Parke S. Rouse Jr. has pointed this out in his published work. On June 26, 1912, the Richmond Times-Dispatch newspaper ran an editorial which dubbed the town 'Lotusburg' for "Tuesday was election day in Williamsburg but nobody remembered it. The clerk forgot to wake the electoral board, the electoral board could not arouse itself long enough to have the ballots printed, the candidates forgot they were running, the voters forgot they were alive." However, even if such complacency existed, a dream of one Episcopal priest was to expand and change Williamsburg's future thus providing it a new major purpose, turning much of it into a massive living museum. In the early 20th century, one of the largest historic restorations ever undertaken in the US was championed by the Reverend Dr W. A. R. Goodwin of Williamsburg's Bruton Parish Church. Initially, Goodwin had just aimed to save his historic church building. This he accomplished by 1907, in time for the 300th anniversary of the founding of the Episcopal Church in Virginia. However, upon returning to Williamsburg in 1923 after serving a number of years in upstate New York, he realized that many of the other colonial-era buildings which remained were also in deteriorating condition: their survival was at stake. Goodwin dreamed of a much larger restoration along the lines of what he had accomplished with his historic church. A cleric of modest means, he sought support and financing from a number of sources before successfully attracting the interest and major financial support of Standard Oil heir and philanthropist John D. Rockefeller Jr. and his wife Abby Aldrich Rockefeller. Their combined efforts created Colonial Williamsburg, involving restoration of much of the downtown Williamsburg area and the creation of a 301-acre (1.22 km2) Historic Area, celebrating the patriots and the early history of America. Today, Colonial Williamsburg is Virginia's largest tourist attraction (based upon attendance) and is the cornerstone of the Historic Triangle with Jamestown and Yorktown joined by the Colonial Parkway. In the 21st century, Williamsburg has continued to update and refine its attractions. There are more features designed to attract modern children and to offer better and additional interpretation of the African-American experience in the town. A century after Goodwin's work began, this masterpiece of Virginia and United States history remains a remarkable work-in-progress. In addition to the Historic Area of Colonial Williamsburg, the city's railroad station was restored to become an intermodal passenger facility (see Transportation section below). Nearby in James City County, the old c. 1908 C&O Railway combination passenger and freight station at Norge was preserved and with a donation from CSX Transportation was relocated in 2006 to a site at the Croaker Branch of the Williamsburg Regional Library. Other landmarks outside the historic area include Carter's Grove and Gunston Hall. The third of three debates between Republican President Gerald Ford and Democratic challenger Jimmy Carter was held at Phi Beta Kappa Memorial Hall at The College of William & Mary on October 22, 1976. Perhaps in tribute to the debate's historic venue, as well as to the United States Bicentennial celebration, both candidates spoke of a "new spirit" in America. The 9th G7 summit was held in Williamsburg in 1983. The summit participants discussed the growing debt crisis, arms control and greater co-operation between the Soviet Union and the G7 (now the G8). At the end of the meeting, Secretary of State George P. Shultz read to the press a statement confirming the deployment of American Pershing II-nuclear rockets in West Germany later in 1983. On May 3, 2007, Britain's Queen Elizabeth II visited Jamestown and Williamsburg, Virginia. Her previous visit to Williamsburg had been in 1957. Many world leaders, including US President George W. Bush, visited Jamestown to mark the celebration of its 400th anniversary, having been founded on May 3, 1607. The celebration began in part in 2005 with events leading up to the anniversary, and was celebrated statewide throughout 2007, though the official festivities took place during the first week of May. On February 5, 2009, President Barack Obama took his first trip aboard Air Force One to a House Democrats retreat in the city to attend and address their "Issues Conference." According to the United States Census Bureau, the city has a total area of 9.1 square miles (23.6 km2), of which 8.9 square miles (23.1 km2) is land and 0.2 square miles (0.5 km2) (1.8%) is water. Williamsburg is spread upon a ridge on the Virginia Peninsula between the James and York Rivers. Queen's Creek and College Creek partly encircle the city. James City County is located to the west and south of Williamsburg, while York County is to the north and east. As with all cities in Virginia, Williamsburg is legally independent of both counties. The city is located on the I-64 corridor, 45 miles (72 km) southeast of Richmond and approximately 37 miles (60 km) northwest of Norfolk. It is in the northwest corner of Hampton Roads, which is the 37th largest metropolitan area in the United States with a total population of 1,576,370. Within Hampton Roads, the city of Norfolk is recognized as the central business district, while the Virginia Beach seaside resort district and Williamsburg are primarily centers of tourism. Williamsburg is located in the humid subtropical climate zone, with cool to mild winters, and hot, humid summers. Due to the inland location, winters are slightly cooler and spring days slightly warmer than in Norfolk, though lows average 3.2 °F (1.8 °C) cooler here due to the substantial urban build-up to the southeast. Snowfall averages 5.1 inches (13 cm) per season, and the summer months tend to be slightly wetter. With a period of record dating only back to 1951, extreme temperatures range from −7 °F (−22 °C) on January 21, 1985, to 104 °F (40 °C) on August 22, 1983, and June 26, 1952. As of the census of 2010, there were 14,068 people, 3,619 households, and 1,787 families residing in the city. The population density was 1,404.1 people per square mile (542.4/km²). There were 3,880 housing units at an average density of 454.1 per square mile (175.4/km²). The racial makeup of the city was 74.0% White, 14.0% Black or African American, 0.3% Native American, 5.7% Asian, 0.0% Pacific Islander, 2.5% from other races, and 3.5% from two or more races. 6.7% of the population were Hispanics or Latinos of any race. There were 3,619 households out of which 16.5% had children under the age of 18 living with them, 37.2% were married couples living together, 9.6% had a female householder with no husband present, and 50.6% were non-families. 35.9% of all households were made up of individuals and 11.4% had someone living alone who is 65 years of age or older. The average household size was 2.07 and the average family size was 2.66. The age distribution was: 9.6% under the age of 18, 46.0% from 18 to 24, 17.7% from 25 to 44, 15.0% from 45 to 64, and 11.7% who are 65 years of age or older. The median age was 23 years. For every 100 females, there were 81.3 males. For every 100 females age 18 and over, there were 80.8 males. The median income for a household in the city was $37,093, and the median income for a family was $52,358. Males had a median income of $28,625 versus $26,840 for females. The per capita income for the city was $18,483. 18.3% of the population and 9.3% of families were below the poverty line. Out of the total population, 29.7% of those under the age of 18 and 5.5% of those 65 and older were living below the poverty line. Williamsburg is notable for the fact that a high proportion of city residents derive a significant percentage of their annual income from investment sources, either in addition to or in lieu of income from work. This is because many retirees relocate to Williamsburg, who typically draw income from investments such as 401(k) plans and the like (see also retirement community). The tourist volume of Colonial Williamsburg has attracted many other related businesses to the area. Notable among these was Anheuser-Busch, which established large operations in James City County and York County just outside the city. The company operates a large brewery there. The company also used to operate two theme parks near the brewery, Busch Gardens Williamsburg, and Water Country USA; however, both properties were sold to private investors following Anheuser-Busch's takeover by foreign brewer InBev in 2010. Anheuser-Busch also previously operated a commerce park, McLaw's Circle, and Kingsmill on the James a gated residential neighborhood that contains a resort of the same name. Williamsburg contains one outlet mall, Williamsburg Premium Outlets. A second outlet mall, Williamsburg Outlet Mall, closed in December 2013. Williamsburg Pottery Factory also contains outlet stores. As with most of Virginia (the Northern Virginia/Washington D.C. metro area being the notable exception), Williamsburg is most often associated with the larger American South. People who have grown up in the Hampton Roads area have a unique Tidewater accent which sounds different from a stereotypical Southern accent. Vowels have a longer pronunciation than in a regular southern accent. For example, "house" is pronounced "hoose" in the Tidewater accent. However, due to the strong military presence in the Tidewater Area, the Tidewater accent has been slowly dying out for years. View of Duke of Gloucester Street in Colonial Williamsburg. Williamsburg is perhaps best known for its tourist and historical points of interest, the centerpiece of which is Colonial Williamsburg, which is essentially a living history museum, depicting the lifestyles and culture of the 18th century colonial period in American history. Major points of interest in this historic district include the Virginia's first capitol building, the Governor's Palace, Bruton Parish Church (the oldest continually operating church in the United States), the Peyton Randolph House (home of Peyton Randolph, the first President of Continental Congress and rumored to be haunted) and The College of William & Mary. Other highlights in the city include The Williamsburg Winery (Virginia's largest winery), the Williamsburg Botanical Garden, the National Center for State Courts and the Virginia Musical Museum. Also located in Williamsburg are two major theme parks, Busch Gardens Williamsburg and Water Country USA, as well as Go-Karts Plus action park and 2 miniature golf courses. The 200-acre (0.81 km2) Williamsburg Pottery Factory shopping complex visited by 3 million people annually is located at nearby Lightfoot, Virginia. "Artistic" and ornamental items are sold at the Market Square shops adjacent to the colonial area, and at many stores on Richmond Road. Presidents Park was an educational attraction that displayed outdoor statue heads of all 43 presidents, each one accompanied by a descriptive biographical plaque. However, in 2010, Presidents Park closed due to financial issues. Williamsburg is primarily served by two newspapers: The Virginia Gazette and Williamsburg-Yorktown Daily. The Gazette is a bi-weekly, published in Williamsburg, and was the first newspaper to be published south of the Potomac River, starting in 1736. Its publisher was William Parks, who had similar ventures in Maryland. After Parks death in 1750, the newspaper was started up again by William Hunter (Parks' shop foreman) in 1751. The Daily Press, published in nearby Newport News, covers local, regional and national news. The College of William & Mary has two student newspapers; the student-fee-supported campus newspaper is The Flat Hat while the independent campus newspaper is The Virginia Informer. William & Mary students produce many other publications and run their own radio station, WCWM. Hampton Roads Magazine serves as a bi-monthly regional magazine for Williamsburg and the Hampton Roads area. Williamsburg is served by a variety of radio stations on the AM and FM dials, with towers located around the Hampton Roads area. Williamsburg is served by the Norfolk–Portsmouth–Newport News designated market area (DMA), which is the forty-second largest in the U.S. with 712,790 homes (0.64% of the total U.S.). Federally, Williamsburg is part of Virginia's 2nd congressional district, represented by Democrat Elaine Luria, elected in 2018. When Williamsburg received its charter in 1722, it had portions located in both James City and York County. In 1870, the Virginia General Assembly changed the boundaries so that it was entirely within James City County. A year later, a new state constitution created the political entity known as an independent city, which is not located in any county. Williamsburg subsequently incorporated as a city in 1884 and separated from James City County. However, it continues to share several constitutional officers with James City County. The city also operates a joint school division with James City County, under voluntary agreement which leaders revisit at planned intervals. Williamsburg, as an independent city, has operated under the council-manager form of government since 1932. The Mayor is elected by the city council, and presides over council meetings and served as the Chief Elected Official for the city. The city council consists of five members that serve staggered, four-year terms. A city manager is hired by the city council, and is comparable to a corporation's chief executive officer. This person is usually a professionally trained public administrator, who is charged with implementing the policies and directives of the city council, and has broad administrative authority with strict rules prohibiting political interference in administrative matters. As of 2016[update], the current Mayor of the city of Williamsburg is Paul Freiling, and the Vice Mayor is Scott Foster. Other members of the city council are Douglas Pons, Barbara Ramsey, and Benming Zhang. The current city manager is Marvin L. Collins III. The city now shares all constitutional officers, courts, and the Williamsburg-James City County Public Schools system (WJCC) with adjacent James City County, and is the county seat. Until 1998, the city had its own Sheriff's Office. It was consolidated with the James City County Sheriff's Office, becoming Williamsburg-James City County Sheriff's Office. As a college town, Williamsburg's large student population has also resulted in a few conflicts with the local city government. For example, in addressing concerns of property values and noise complaints near the campus, the council has undertaken initiatives to reduce student off-campus residential presence in the city by instituting a maximum occupancy rule of three unrelated persons for single-family dwellings, as well as a plan to buy rental houses with taxpayer dollars and resell them with the stipulation that the new owners must occupy them. Prior to July 1, 2007, the voting registrar, David Andrews, had interpreted Virginia law to exclude a high percentage of students. He argued that students should be registered where their parents live. The new voter registrar, Win Sowder, said she is registering students as she would "any other resident of the city. If they're living in the dorms for eight months out of the year, and have an address located within the city limits on a Virginia driver's license, they're entitled to register to vote." 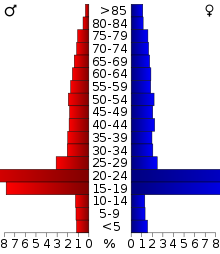 In presidential elections, Williamsburg was a Republican-leaning city for most of the time from the 1950s through the 1980s. From 1948 to 1988, it only supported a Democrat once, during Lyndon Johnson's landslide victory in 1964. This changed in the 1990s when Democrat Bill Clinton won Williamsburg in both of his presidential campaigns. Due in part to Green Party candidate Ralph Nader's strong showing as a left-wing protest candidate in the college town, Republican George W. Bush was able to secure a very narrow plurality in 2000. Democrat John Kerry won the city by a single-digit margin over Bush in 2004. In the elections since then, however, Williamsburg has swung heavily to the Democrats, and has become one of the most Democratic areas of Hampton Roads. Democrat Barack Obama swept Williamsburg by landslide 30-point margins in both the 2008 and 2012 elections. In the 2016 election, Democrat Hillary Clinton beat Republican Donald Trump in Williamsburg by a 45-point margin, Clinton receiving 68% of the city's vote to only 25% for Trump, and 7% who preferred neither. The public school system is jointly operated by the city of Williamsburg and James City County. The Williamsburg-James City County Public Schools system (known informally as "WJCC") consists approximately 9,000 students in 15 schools—9 elementary schools, 3 middle schools, and 3 high schools. Within the county's boundaries, the two established high schools, Lafayette, and Jamestown, are considered above average institutions. A third high school, Warhill, opened in the Lightfoot area in August 2007. The ninth elementary school, JB Blayton, opened in 2010 along with the new middle school to replace James Blair, Lois S. Hornsby Middle School. James River Elementary School, located in the Grove Community in the county's southeastern end, is a magnet school. It offers the International Baccalaureate Primary Years Programme, one of only five such schools Virginia to do so. For the 2001–2002 academic year, the public school system was ranked among the top five school systems in the Commonwealth of Virginia and in the top 15% nationwide by Expansion Management Magazine. There are also two regional Governor's Schools in the area that serve gifted and talented students. The Wren Building on the campus of The College of William & Mary. The city has also been the home to The College of William & Mary since its founding in 1693, making it America's second oldest college (behind Harvard University). Technically a university, William & Mary was also the first U.S. institution to have a Royal Charter, and the only one to have coat-of-arms from the College of Arms in London. The College campus closely adjoins the Historic District, and the Wren Building of the College at the head of Duke of Gloucester Street was one of the earliest restored by the efforts of Reverend Dr. W. A. R. Goodwin and the family of John D. Rockefeller Jr. as they began creating what is now commonly known as Colonial Williamsburg. Over 70% of the students of the College either work part-time or serve as volunteers in the community. Students contribute over 300,000 hours of volunteer service to the Williamsburg community annually. There are also three community colleges, offering associate degrees and college transfer programs, within a twenty-five mile radius of Williamsburg: Thomas Nelson Community College, Paul D. Camp Community College, and Rappahannock Community College. A branch of Thomas Nelson Community College is located just east of the city limits in James City County. Williamsburg is located adjacent to Interstate 64 and U.S. Route 60, which connect the city with Richmond to the northwest and Norfolk to the southeast. State Route 199, officially named the Humelsine Parkway after a former Colonial Williamsburg president, surrounds the city in a semicircle. State Route 5 links the city with the James River Plantations along the north shore of the James River, Interstate 295 and Richmond. State Route 31 provides a route to Jamestown and the toll-free Jamestown Ferry. The Colonial Parkway provides a bucolic low-speed link to Jamestown and Yorktown, passing under Colonial Williamsburg in a tunnel. With the exception of buses, commercial vehicles are not allowed on the Parkway. The community's public bus system, Williamsburg Area Transit Authority (WATA), has its central hub at the transportation center. A network of disabled-accessible transit bus routes serve the city, James City County, and most portions of York County adjacent to the Williamsburg area, with hourly service seven days a week, and half-hourly service on select routes during peak weekday hours. The routes operated by WATA include a loop around the William & Mary campus while classes are in session. The system also provides paratransit services and operates replica trolley buses at the Yorktown Riverfront attraction. 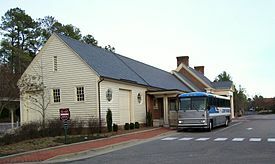 WAT connects with the much larger Hampton Roads Transit (HRT) bus system at Lee Hall in northwestern Newport News and at the Williamsburg Transportation Center. Walking is a major mode of transportation in Williamsburg, with about a fifth of people walking to work between 2006 and 2010. Walk Score, a website which algorithmically determines how friendly communities are to walkers, describes the city as "very walkable". With few exceptions, motorized traffic is not allowed on Duke of Gloucester Street, which passes through Colonial Williamsburg and the shopping district of Merchant's Square. The city is also increasingly bicycle-friendly, having built 48 miles of bicycle facilities in the area since 1992. Upon completion, the Virginia Capital Trail will provide a paved off-road path to Richmond for bicyclists and pedestrians via the Colonial Parkway. The primary airport for the Virginia Peninsula is the Newport News/Williamsburg International Airport in Newport News, a twenty-minute drive from Williamsburg. Norfolk International Airport and Richmond International Airport also serve passengers from the city. Amtrak serves Williamsburg with three trains a day stopping at the Amtrak Station. The line runs west along the Virginia Peninsula to Richmond and points beyond. A high-speed rail connection at Richmond to both the Northeast Corridor and the Southeast High Speed Rail Corridor are also under study. Intercity bus services are provided by Greyhound. Waller Mill Reservoir is the main water source for the City of Williamsburg. A 350-acre lake holding 1.5 billion gallons of water, it has been in operation since 1945. The City owns a large percentage of the surrounding watershed. During drought, this source may be supplemented by groundwater from a well at Waller Mill and from raw (untreated) water from Newport News Waterworks under a long-term agreement. John Amson, English physician and former alderman and mayor of Williamsburg. John Blair Jr., a signer of the United States Constitution. Lemuel J. Bowden, former US Senator. Bruce Hornsby, singer and keyboardist. John Nicholas, former US Congressman. Robert C. Nicholas, former New York State Senator. Robert Carter Nicholas Sr., judge. Wilson Cary Nicholas, former US Senator. Lorenzo Taliaferro, Baltimore Ravens running back. Lawrence Taylor, former New York Giants linebacker. John Tayloe II, owner of Tayloe House. ^ a b TEGNA. "Williamsburg City Council elects new mayor, vice mayor". 13newsnow.com. ^ a b "State & County QuickFacts". United States Census Bureau. Archived from the original on October 5, 2015. Retrieved October 4, 2015. ^ Huh, Jin (March 2002). "Tourist Satisfaction with Cultural/Heritage Sites: The Virginia Historic Triangle" (PDF). Virginia Polytechnic and State University. Archived from the original (PDF) on September 4, 2012. Retrieved July 12, 2012. ^ Morgan 2004, pp. 21–22. ^ Charles A. Grymes (1998). "Second-Worst Decision of the State of Virginia?". Retrieved February 20, 2007. ^ "Wren Building: Oldest academic structure in America". History.org. The Colonial Williamsburg Foundation. Retrieved August 18, 2016. ^ "Williamsburg Was Site Of First Confederate Hospital". Daily Press. May 20, 1998. Retrieved August 18, 2016. ^ "Timeline: William & Mary 1693-1993". Daily Press. February 7, 1993. Retrieved August 18, 2016. ^ "Historical Facts (1850–1899)". The College of William and Mary. Archived from the original on July 4, 2008. Retrieved March 26, 2008. ^ "Chesapeake & Ohio Historical Society". Retrieved July 3, 2016. ^ "Benjamin Stoddert Ewell (1810 - 1894) - Find A Grave Memorial". Retrieved July 3, 2016. 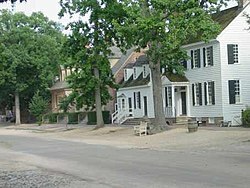 ^ "WPA_Guide: Colonial Williamsburg: The Corporate Town-Before". Retrieved July 3, 2016. ^ Puente, Maria (May 4, 2007). "Queen, Cheney tour Jamestown". USA Today. Retrieved July 27, 2014. ^ Evans Asbury, Edith (October 17, 1957). "Special to The New York Times. Queen in Virginia, acclaims leaders of the revolution". New York Times. ^ "Recap of America's 400th Anniversary Events". America's 400th Anniversary Legacy Site. CINIVA. Retrieved 20 February 2019. ^ "Obama Goes Airborne Today For First Time As President". Retrieved July 3, 2016. ^ "NowData - NOAA Online Weather Data". National Oceanic and Atmospheric Administration. Archived from the original on May 22, 2013. Retrieved May 3, 2013. ^ "Virginia's Many Voices". Fairfax County Public Library. Archived from the original on August 30, 2008. Retrieved March 7, 2008. ^ "Williamsburg Pottery Homepage - Virginia". Retrieved July 3, 2016. ^ "The Williamsburg Winery -". Retrieved July 3, 2016. ^ "Williamsburg Yorktown Daily - Your source for free news and information in Williamsburg, James City & York Counties". Retrieved July 3, 2016. ^ "Hampton Roads news, information, weather, hurricane coverage, sports, entertainment, restaurants, real estate, jobs, business, classifieds". Daily Press. Retrieved July 3, 2016. ^ Bryson 2000, p. 526. ^ "City Council". City of Williamsburg, VA. Archived from the original on December 26, 2016. Retrieved December 26, 2016. ^ "City of Williamsburg : City Manager's Office". www.williamsburgva.gov. Archived from the original on December 26, 2016. Retrieved December 26, 2016. ^ "History of the Sheriff's Office". James City County, VA. Retrieved December 26, 2016. ^ Evans, James (November 5, 2004). "Three's a Crowd, Four is Illegal". DoG Street Journal. Archived from the original on March 19, 2007. Retrieved May 30, 2006. ^ Damon, James (March 17, 2006). "City Council Votes to Purchase House". The Flat Hat. Archived from the original on September 2, 2006. Retrieved May 30, 2006. ^ Day, Shawn (September 26, 2007). "Registrar gives nod to students". Daily Press. Newport News, Virginia. ^ "About James River Archived September 24, 2008, at the Wayback Machine." James River Elementary School. Retrieved on February 24, 2007. ^ Whitson, Brian (April 27, 2006). "Community contributions: Students invest more than 300,000 hours". William and Mary News. Retrieved May 31, 2006. ^ "Colonial National Historical Park (U.S. National Park Service)". Retrieved July 3, 2016. ^ "Home - WATA". Retrieved July 3, 2016. ^ "Route 121- Hampton Roads Transit" (PDF). Retrieved October 9, 2016. ^ "Selected Economic Characteristics: 2006-2010 American Community Survey 5-Year Estimates". U.S. Census Bureau. Retrieved July 12, 2012. ^ "Walk Score of Williamsburg VA". Retrieved July 12, 2012. ^ "Duke of Gloucester Street". Retrieved July 3, 2016. ^ "BikeWalk to Work Day 2012". City of Williamsburg. Archived from the original on February 12, 2011. Retrieved July 12, 2012. ^ "Directions". Newport News/Williamsburg International Airport. Retrieved December 26, 2016. ^ "Southeast High Speed Rail". Southeast High Speed Rail. Archived from the original on May 15, 2013. Retrieved October 15, 2007. ^ "Water/Sewer Division". City of Williamsburg. Archived from the original on December 27, 2016. Retrieved December 26, 2016. ^ "A Biography of John Blair 1732-1800". University of Groningen. Retrieved August 18, 2016. Bryson, William Hamilton (2000). Virginia Law Books: Essays and Bibliographies, Volume 239. American Philosophical Society. ISBN 0871692392. McCartney, Martha W. (1977). James City County: Keystone of the Commonwealth. Virginia Beach: Donning and Company. ISBN 0-89865-999-X. Morgan, Timothy E. (2004). Williamsburg: A City that History Made. Charleston, SC: Arcadia. ISBN 978-0-738-52473-3.